The 864th anniversary of the official founding of Moscow was the reason for a spectacular laser show projected against the truly massive, Stalin-gothic tower of Moscow State University. 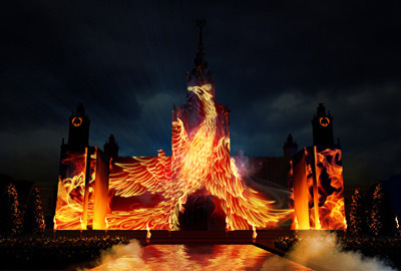 What Russian laser show would be complete, though, without this dramatic firebird? Watch this youtube video for a full sense of this pretty extraordinary display.